Deluxe rooms : With palaceand valley views, these deluxe rooms are understated yet luxurious. 70 in all, they feature walk-in closets and perfectly appointed bathrooms with windows overlooking panoramic views of the valley or of the Palace. Each room opens onto large balconies with picture-perfect views, ideal for a private meal. 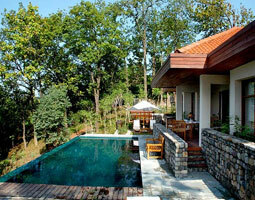 Deluxe suites : The 3 Deluxe Suites face either the Valley or the Maharaja’s palace. These 2-bay suites feature tastefully appointed bedrooms with attached sitting rooms and large bathrooms with tranquil garden views. Secluded private gardens with tented salas situated to overlook the valley, add to the charm and privacy of these suites. The Ananda suite : Housed on the ground floor and overlooking the valley, the 3-bay Ananda Suite spells luxury and enchantment. With luxuriously fitted bathrooms overlooking the view and its own private sitting and dining areas, the suite also has a large private garden, which is perfect for intimate dinners and leisurely breakfasts. The Viceregal suite : In the precincts of the Maharaja’s Palace, The Viceregal suite is a perfect retreat for the connoisseur. It comprises of a spacious sitting and dining area and a plush bedroom featuring a period four-poster bed. The attached dressing room and bathroom are beautifully appointed with antique fittings and furniture. With its own private terrace and a roof top Jacuzzi overlooking the sloping landscaped gardens and the distant Ganges Valley, staying at the Viceregal suite takes you back into India’s regal past. Villas: Named after the great mountain ranges Himalay and Shivalik and the river Ganga that sustains the people of the Valley, these beautiful villas are a dreamer’s escape.Two 2-bedroom villas and one 1-bedroom villa, each elegantly appointed with a living room, a pantry for the butler, a dressing room and a huge bathroom featuring a private sauna with an unhampered view of the swimming pool. GINGER HONEY LEMON TEA: Ananda’s special elixir eliminates toxins, clears the palate, soothes the stomach and activates the endocrine system. Just select your preference on the card before you retire for the night. 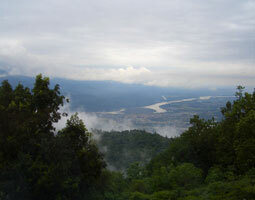 GETTING THEREAnanda is located in the Himalayan foothills, 260 kms north of New Delhi in the state of Uttaranchal. 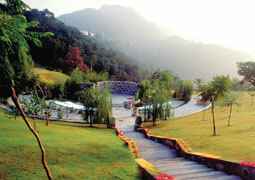 A 45 minute flight to Jolly Grant airport (and 35kms drive), or a 4 hour train journey from Delhi to Haridwar station (and 42kms drive) or a 5 hour drive from New Delhi will get you to tranquil Ananda. 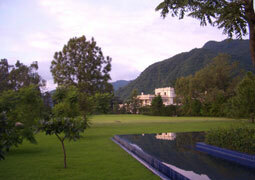 AYURVEDA AT ANANDA At Ananda, Ayurveda forms an intrinsic part of the wellness regime for the guests. From massages and specialized diet programme to fulfill personal goals to the more rigorous transformations in lifestyle, the Ayurveda experience has been designed keeping in mind the individual’s desire to heal, cleanse, relax and revitalize. The authenticity and our commitment to this ancient life system is evident in the use of age-old powders; oils, vessels, wooden beds, treatment rituals and qualified therapists trained in traditional Ayurvedic schools. Be it a carefully monitored Ayurveda meal or a traditional massage, your body and spirit undergo a holistic metamorphosis, in the most pristine Himalayan environment, traditionally believed to be the fountainhead of Ayurveda. Ananda Ayurvedic Therapy programmes are prescribed by the physician after a detailed consultation, which specifies daily routines, diet and wellness activities. The consultation focuses on balancing the three bio energetic forces (doshas) in the human body, namely Vata, Pitta and Kapha. Ayurvedic and Wellness Consultation (30 minutes) The Ayurvedic consultation explores your physical, mental and emotional health to help you understand your unique energetic constitution or combination of Doshas (the three dynamic living forces) that determines your body type and your current imbalances. The Ayurvedic physician then prepares a sequence of experiences and a programme of diet and exercise according to your body type that will help bring more balance, energy and peace to your entire being. 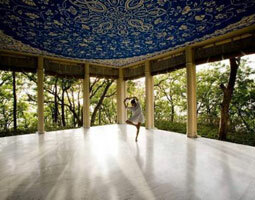 Ayurvedic Lifestyle Recommendation (30 minutes) Ayurveda promotes a lifestyle that is in harmony with Mother Nature. In this Consultation, the benefits of the experiences, diet and exercise programme during your stay are evaluated. The Ayurvedic physician then gives you the tips and take-home information on your lifestyle and dietary changes that will bring balance into your daily life so that your continuing commitment to your wellbeing can bring you back to a state of vibrant health and radiance.